Mozilla Thunderbird is a one of the best email client for Linux. And today we will see how to install this free, open source and cross-platform email application in CentOS 7. We are lucky, Because Thunderbird is available in the default CentOS software repository, which means we can do the installation with yum command without downloading or adding any other third party software or repositories. 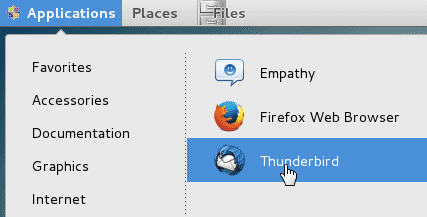 You can open Thunderbird using either from Applications menu or using Linux Terminal Window. To open using Linux terminal, just type..
Now you have Thunderbird Installed on your CentOS 7 Computer, Now you can configure Thunderbird as pop3 or IMAP email client to use your existing email Address. For That you will at least need Following Information. Those Information you can get from your email service provider.